1. Hit the grass beds. In the summertime, the water heats up and loses its ability to hold oxygen. Aquatic grass beds act like lungs, pumping oxygen into the water all summer long, attracting fish and other aquatic animals like crayfish and insects. Grass beds also slow current and provide cover for baitfish and other bass forage, making them magnets for roving bass. 2. Target current seams. 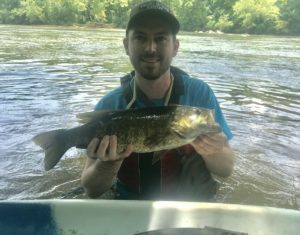 Trophy bass don’t get big by wasting their energy chasing down food. Instead, these lunkers let the current deliver their food to them as they wait in place. Bass stack up in pockets of slow-moving water just downstream of features like rocks, logs, and islands, and they face into the current so they can dart out and grab food tumbling by. Locate these hungry bass by fishing along and across “current seams” that indicate a transition between fast and slow water. 3. Tie on a minnow imitation. 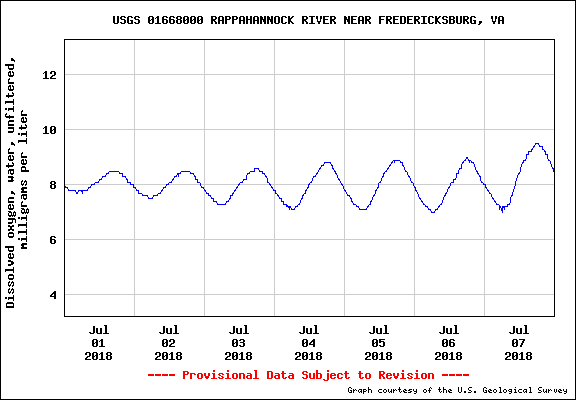 Recent DGIF fish studies revealed that smallmouth in the upper Rappahannock River system are growing faster than ever before, due to increased food availability from spawning anadramous fish like shad and herring enabled by the removal of Embrey Dam. Bass spend the summer feasting on schools of juvenile shad and herring about the size of your finger. Spin-anglers should match the hatch using soft plastic minnow imitations like grubs and senko worms, while flyfishers should consider a shad-style streamer.